A special thanks to MyBid4It for sponsoring this event. MyBid4It is an online auction platform which has been developed to partner with Estate Agents and revolutionise the way properties are bought and sold across the UK. 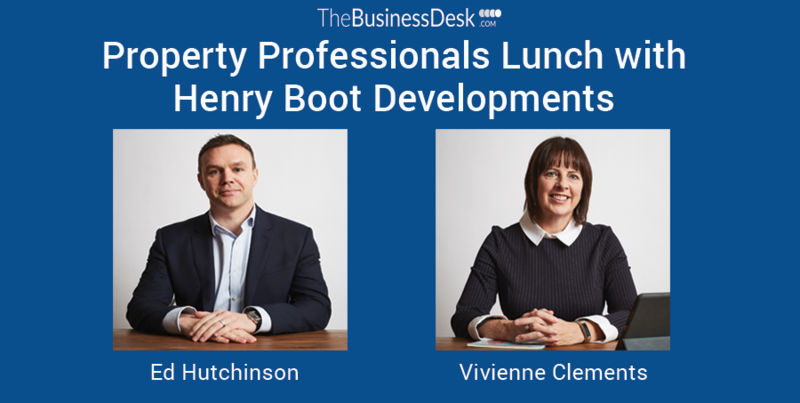 Two executive management team members at Sheffield-headquartered property developer, Henry Boot Developments (HBD) will speak at TheBusinessDesk.com’s upcoming Property Professionals Lunch. Managing director Ed Hutchinson and director Vivienne Clements will share with delegates their perspectives on the industry at present at the event, to be held at Piccolinos in Sheffield. They will update the audience on the firm’s strategic development and priorities for the Yorkshire region; as well as share insights into the performance, opportunities and challenges in the property industry. HBD is a very active player in the regional marketplace and beyond. It is currently working with a UK development pipeline in excess of £1bn. Both Ed and Vivienne will share their thoughts on speculative and industrial schemes of significance, how to attract investors and reflect on occupier demand. Ed joined HBD in 2004 as a Project Manager following five years with Rex Procter and Partners. After just eight years with HBD, he was made board director, since which time he has been an intrinsic part of the business’ executive management team, culminating in his appointment to Managing Director in September 2018. The last 15 years have seen Ed play an instrumental role in bringing forward numerous notable and award-winning projects. They include the flagship 200-acre Markham Vale industrial scheme, Axis, Stop24 and The Chocolate Works, the iconic former home of Terry’s chocolate orange in York. He has also been involved in Aberdeen’s £333m TECA – an 850,000 sq ft scheme comprising a conference and exhibition centre, two hotels, an energy centre and a business park. Vivienne joined Henry Boot Developments in 1997 as Development Surveyor, returning to Yorkshire following several years as part of CBRE’s London offices team. Appointed Director in 2009, Vivienne is a central part of HBD’s executive management team. Overseeing the firm’s interests in the North East, Yorkshire and Midlands, she has spearheaded the continued expansion of its portfolio, launching a new Birmingham office in 2017 to drive forward development opportunities in the Midlands. Vivienne benefits from extensive experience in the progression and delivery of joint venture projects for both private and public partners. She is responsible for the delivery of many of HBD’s most high-profile projects, including Markham Vale, where HBD is delivering 3m sq ft of industrial and commercial space with Derbyshire County Council, IAMP, a nationally significant scheme spanning over 370 acres, and New Horizon, the iconic former home of Imperial Tobacco and one of Nottingham’s most important regeneration sites. Along with her role at HBD, Vivienne is also part of the Sheffield Property Association Executive Team and a Girl Guide leader. Both Ed and Vivienne are focused on ensuring schemes are created through partnership working in order to boost the success of regional economies. Book now to join TheBusinessDesk.com’s lunch event, which will provide excellent networking opportunities as well as the chance to hear from two senior and knowledge leaders in the property industry in South Yorkshire.